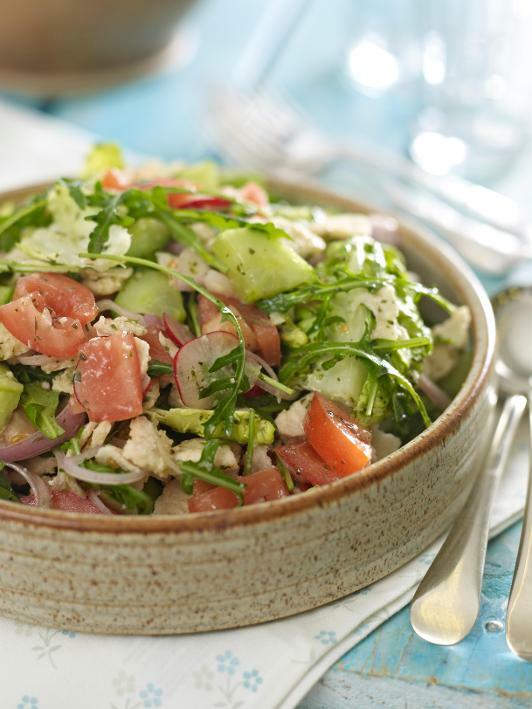 Bring some Middle-Eastern cuisine to your menu with this fresh fattoush salad. It goes well with a falafel wrap or you can even serve it on its own as a starter. Try it with our Fresh Garden Mint Sauce to bring in some special taste. Mix the olive oil, lemon juice, COLMAN’S Fresh Garden Mint Sauce and KNORR Garlic Puree together. Dice the tomatoes and peppers, slice the radish, cucumber and shallots. Wash the lettuce and rocket then drain well. Rip the pitta bread into pieces and dampen with a little water then place into a large mixing bowl. Add the vegetables and leaves then add half the dressing. Mix well and place into a serving bowl. Pour over the remaining dressing ensuring all is covered and serve.